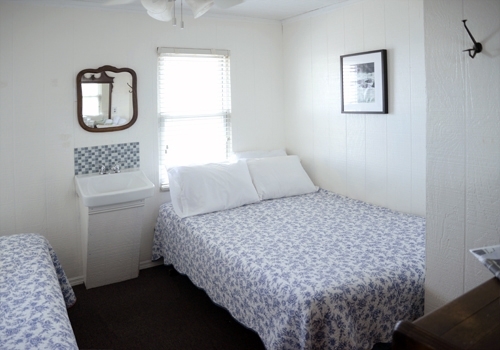 Houser's Hotels guests enjoy the charm and comfort of 10 brightly decorated rooms. Each room is separate and private. Most rooms have a queen size bed, but rooms with two twins, or for three guests, a full size and a twin size bed are also available. All rooms have a/c, ceiling-fan and all rooms except 2 have a toilet and sink in the room, but share bath facilities. Two full baths with tiled showers are found in two locations just down the hall from the bedrooms. All room rates are given per night. All room rates exclude 11.625% sales and occupancy tax. If you need to cancel, for any reason, a credit for a future stay will be issued. Minimum age to rent a room is 23 years old. ID required. Two twin beds, sink, a/c, and ceiling fan. Two full baths with tile showers are down the hall from the bedroom. The room is bright and facing town. Click here to reserve. One full size bed, sink, a/c and ceiling fan. Two full baths with tile showers are just down the hall from the bedroom. The room is brightly decorated and facing town. Click here to reserve. One queen size bed, ½ bath, a/c and ceiling fan. The room is brightly decorated and facing town and have a view over the bay. Click here to reserve. One queen size bed and one twin size bed, ½ bath, a/c and ceiling fan. This room is bright and comfortable and has a beautiful view over the Great South Bay. Click here to reserve. One queen size bed, ½ bath in the room, a/c ceiling fan. Two twin beds ½ bath, a/c ceiling fan. This room bright and comfortable and has a beautiful view over the Great South Bay. Click here to reserve. One queen size bed, ½ bath in the room, a/c ceiling fan. This room is bright and comfortable and has a beautiful view over the Great South Bay. Click here to reserve. and facing town. Click here to reserve.